Brendon Boyd Urie (b. April 12, 1987 in Las Vegas, Nevada) is the lead singer of the band Panic! at the Disco. He also plays keyboard, accordion, piano, organ, cello, bass, drums and guitar. Urie was raised as a member of The church of Latter Day Saints. He attended Palo Verde High School, located in the unincorporated Las Vegas, NV township of Summerlin. His parents wished for him to attend college, but he pursued his interests in taking part in Panic! at the Disco. He started working with Panic! At The Disco during his senior year of high school. Originally, Urie was not the lead singer; when the band heard him sing backup during a rehearsal they decided to make him the main singer. The band signed a record deal before they even performed on stage. Urie's parents are still very supportive of their son. They were the only parents from Panic! At The Disco to buy a copy of their CD, and purchase a lot of the band's merchandise even though they can receive it for free. 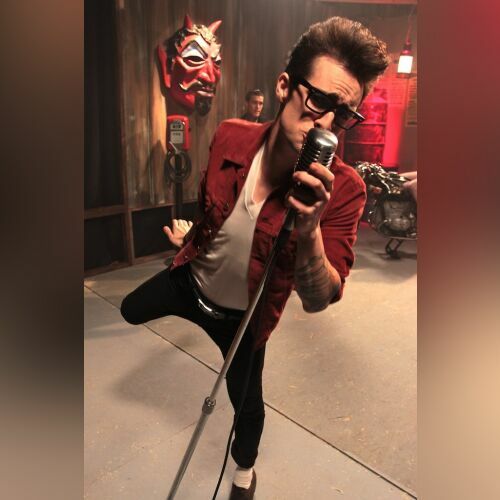 Urie made a cameo appearance along with Panic band member Spencer Smith as a vampire in Fall Out Boy's music video A Little Less Sixteen Candles, A Little More Touch Me. Urie acted as a member of the gang "The Dandies", as well as the leader's apprentice and sidekick. During the fight scene in this video, there are three or more people who begin dancing with girls, and Brendon is in front. He provided backing vocals for Fall Out Boy's song, "7 Minutes in Heaven (Atavan Halen)". Urie was recently named one of Spin.com's Hottest Stars Under 25.